Planning to resign from your post anytime soon? Well, you could, but you probably might have a hard time giving out reasons that are professional enough to your boss. 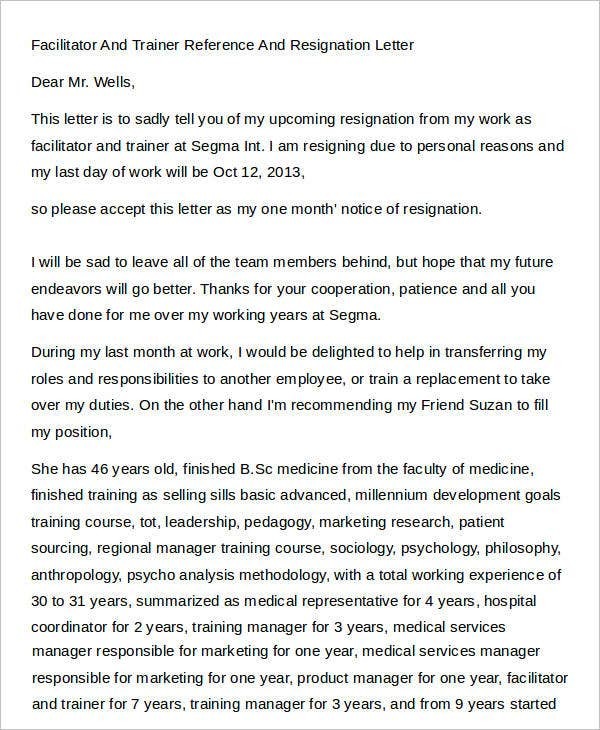 There are a lot of possibilities as to why an employee resigns, and it could actually be anything that’s out of anyone’s control. General situations upon resignation usually come up, and if you are one employee looking for a way out of such dilemma, you should opt to do the right thing and pass a resignation letter than just leaving right away. Download our Best Resignation Letter that could be of great help to any of your immediate resignation letter concerns. So You’re Writing a Personal Resignation Letter . . . If you plan on resigning job due to personal reasons, it is a courtesy that you pass on a resignation letter before leaving. It would be of great help if you do so and your employer will appreciate it despite the short notice. Be particular with the dates. You write your letter with respect from your salutation down to your closing remarks. Employers are very much particular with the date of perhaps your last day of employment or even the date you passed your resignation letter. Reasons should be brief. 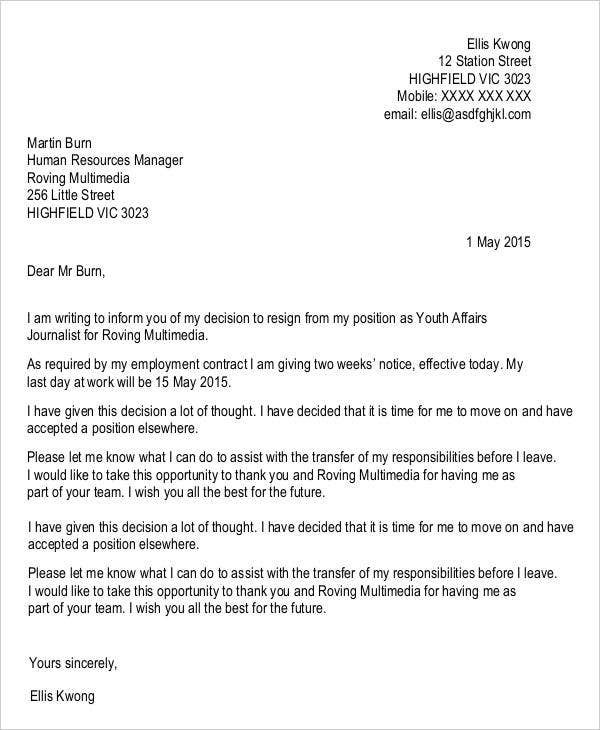 It wouldn’t ease the impact of your resignation if you use flowery words to add to the main point of your reason. Keep your reasons short, and if you can, an explanation to your resignation will be well appreciated by your immediate superiors and boost your hopes of your employer’s kind understanding. Offer assistance. Always be mindful enough to include an offer of assistance in your letter. Your employer might need a little of your help before they could find a replacement. Within your remaining days, it is a form of courtesy that you attend to whatever your employer could ask from you as a favor. Check out our website’s templates on Last-Minute Resignation Letters and Employee Resignation Letter. 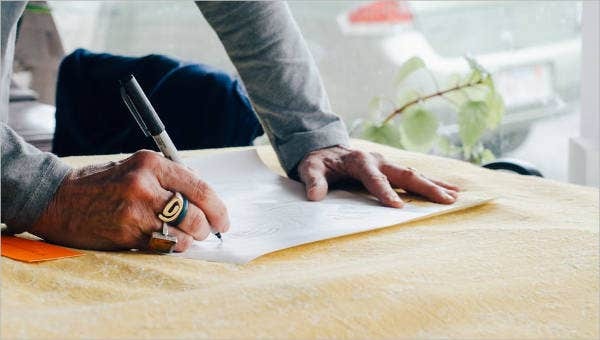 These templates guarantee you a formal business letter format that would definitely save so much of your time putting up with the exact formal format on your letters. Download them now! Offer your apologies. Know that it is but an unfortunate circumstance that you are tendering your resignation. Despite this, make sure you do not forget writing down words of apologies in your application letter document. Be professional. 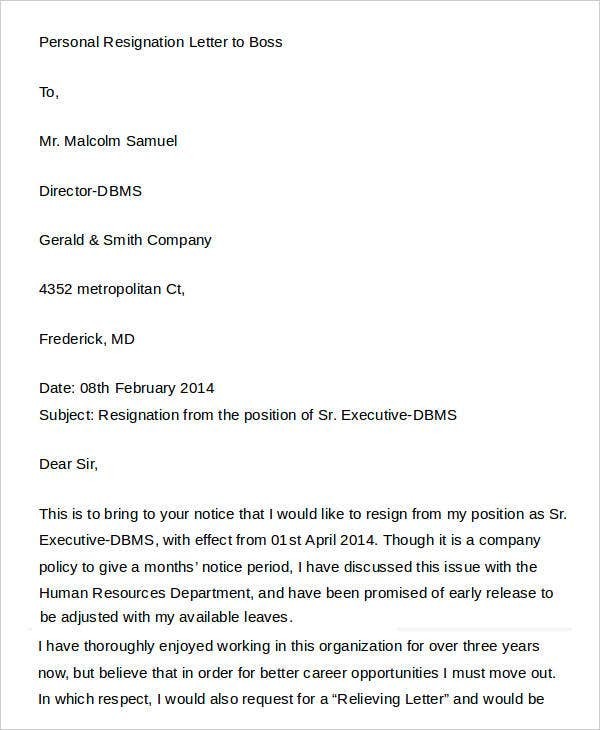 It is important that you keep company relations professional even on your resignation letter. You still have to deal with your employers professionally even if you’re down to a few more days with them. Satisfactory explanation. You would really not need to say so much from your personal life and reasons as well. Even if you’re leaving for personal reasons, keep your explanations written in general. 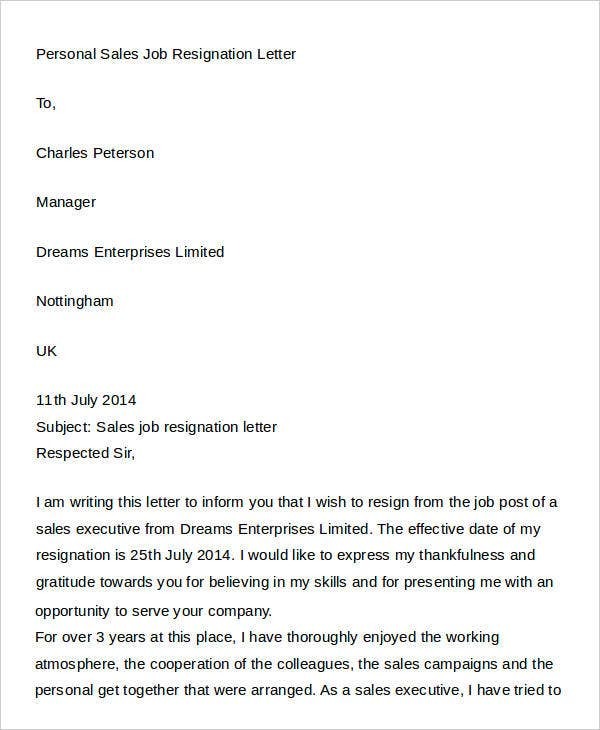 If you need the ideal application letter templates, you might want to make use of our Business Resignation Letter template. 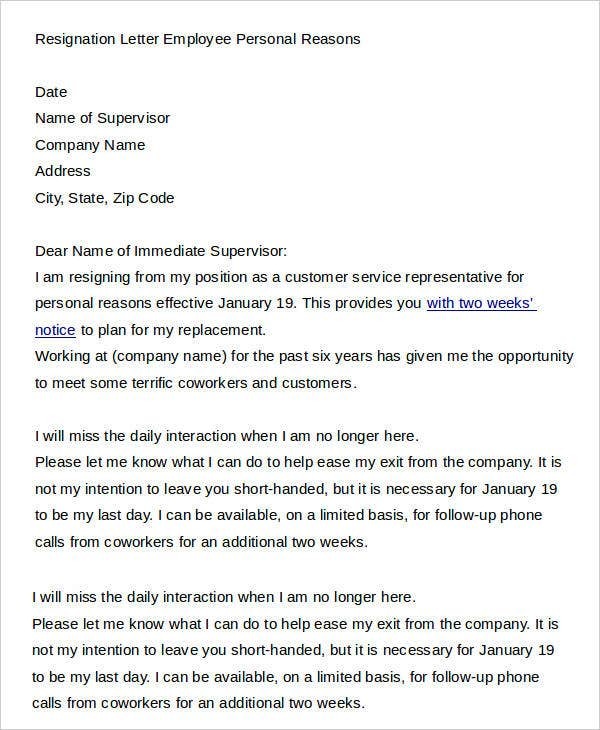 We also have Volunteer Resignation Letter Templates that includes just the right application letter format. Download them now!